Towards the east end of the north nave aisle of the church of St John the Baptist, Aldenham, Hertfordshire, is a worn ledgerstone. 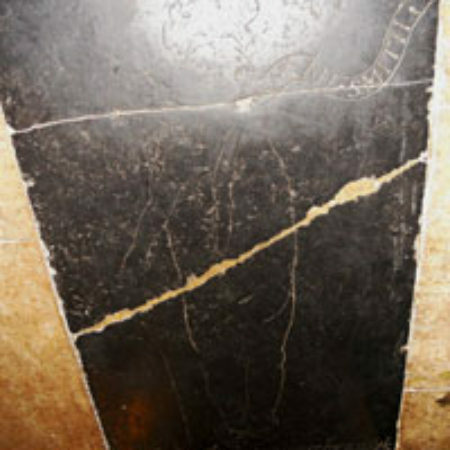 It has the incised outline of a shrouded figure, the shroud knotted at the head and feet, with the outline of the legs clearly depicted. The figure’s bare right arm protrudes and points downwards, and two lines crossing from top sinister to middle dexter of the shroud suggest that the shroud originally revealed the face as well as the right arm and shoulder, but these must have been worn away. A speech-scroll emerges from the area where the mouth may imagined to be, bearing the words ‘SARAH. SMITH.’ in Roman capitals. I Sarah Smith whom thou didst loue alone. For thy dear loue haue layd this marble Stone. 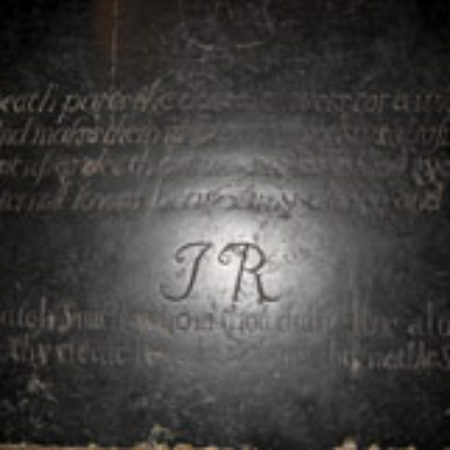 Clearly the shrouded figure represents the shrouded body of John Robinson, and the ledger was commissioned by his surviving lover, Sarah Smith. We know a certain amount about the persons involved in this act of commemoration. Both appear to come from prosperous yeoman families in that part of the parish known as Aldenham Wood. 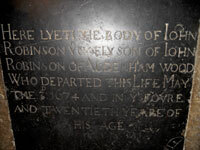 John Robinson’s mother had died before him, and from the evidence of his father’s will of 1675 his only surviving sibling was a sister, married with a family. 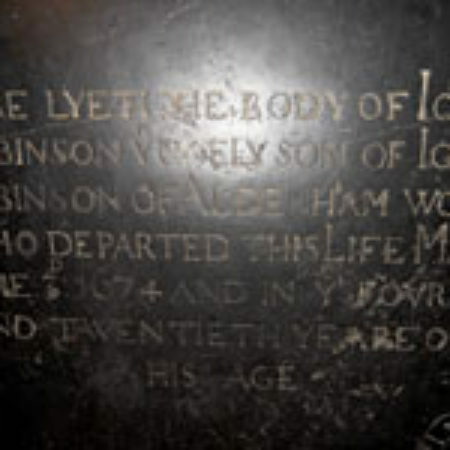 The slab is mentioned in early guidebooks, but its verses are inaccurately transcribed and the shrouded figure is usually misidentified as Sarah Smith. 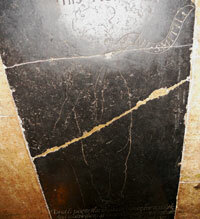 The iconography of the incised slab is complex and raises speculation about who devised it. Each section of text is distinguished by its font. The formal biographical information which heads the slab is in formal Roman capitals; the epitaph, a formal genre despite its personal declaration of enduring love, is in italics – another formal font – and the personal declaration of responsibility for placing the stone is in lower-case Roman, the most commonplace of fonts. There is a movement here from the public to the private, reflected in the growing informality of the lettering. This leaves the shrouded figure, with its speech-scroll. The representation of shrouded figures seems (contrary to received opinion) to have been continuing sporadically in brass and sculptural form through the sixteenth century, rather than dying out and being revived by John Donne’s monument in St Paul’s – there are shroud brasses surviving as late as the 1580s (Leigh, Kent) and shrouded cadavers on tombs as early as that decade (Chesterfield, Derbyshire). 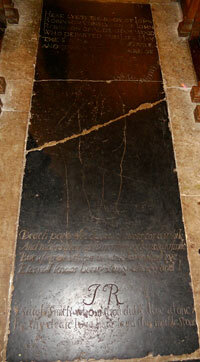 Aldenham itself has a fine sixteenth-n century shroud brass to Lucas Goodyere, who died in childbirth c.1546/7. 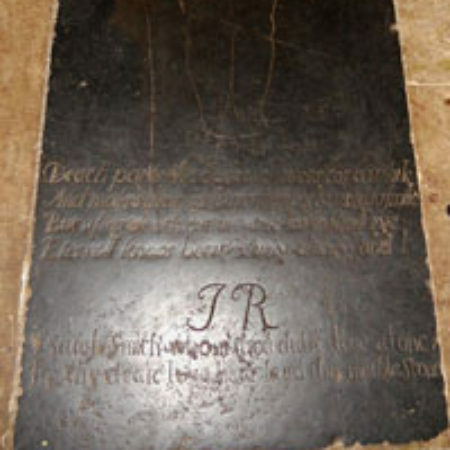 In its outline the shrouded figure of John Robinson seems to resemble that of Henry Butler (d.1647) at Bassingbourn, Cambridgeshire. The position is reversed and Robinson’s legs are positioned differently and enclosed in the shroud, but the draping of the fabric over the upper body, leaving the face clear, is similar. Butler’s monument (ascribed to Burman) has been linked to that of William Curle at Hatfield by Nicholas Stone: are there other comparanda? What the designer of the Robinson monument has done is to combine the latest form of the supine shrouded figure with the speech-scroll. 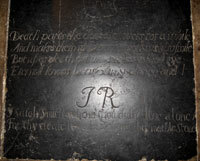 Speech-scrolls are common on brasses and their use extends to at least the 1590s, for example on the brasses to Henry Rolle (d.c.1625) and his wife Margaret Yeo (d.1591) at Petrockstowe, Devon, which were probably erected after her death. Shrouded figures with speech-scrolls survive in smaller numbers, but there is a clear indent of such a brass at Great Livermere, Suffolk, where the shrouded figures flank what was probably a Resurrection scene. Great Liveremere has surviving fragmentary wall-paintings of the Three Living and the Three Dead, and a noli me tangere scene, which may resonate with this brass. As Peter Sherlock points out, the words on the speech-scroll changed at the Reformation from prayers to affirmations of faith, but they were invariably religious in content. Here the words that come out of the dead man’s mouth are not addressed to the Virgin Mary, or to God, but to his lover, Sarah Smith. While this obviously carries on the theme of love triumphing over death, there is an element of blasphemy in it: John Robinson’s faith is directed to his earthly lover, rather than to his heavenly creator. The monument combines a group of tropes – the shroud monument, the speech-scroll, the unquiet grave – to produce an affirmation of undying love. Whether this was devised by Sarah Smith or by the local provider of ledger stones is not clear, but whoever did it was familiar with the traditions of funerary commemoration and able to produce a sophisticated melange for an individual client. Sarah Smith’s devotion did not go unrecognised. When John Robinson Sr died the year after his son he included her in his will, leaving her five pounds, the same amount that he left his wife over and above her pre-nup entitlement (together with a selection of choice household items). To the children of someone to whom he was evidently connected, either by marriage or kinship, he left one pound each. To his grandchildren by his daughter (his only child at death) he left family pieces. Sarah Smith ranks in his will slightly behind his wife, but above other connections – his daughter was his residuary legatee. It is obvious that even after John Robinson’s death Sarah Smith was a beloved member of the Robinson family.